With the snow that came this past weekend, it sure feels like winter is in full swing. I don’t want to sound negative, but this is my least favorite time of the year. The Holidays are over, it’s dark by 5:00pm, the air is cold, the skies are often more gray than sunny, it’s just not my cup of tea (although I do like drinking hot cocoa in the winter-shhh!). 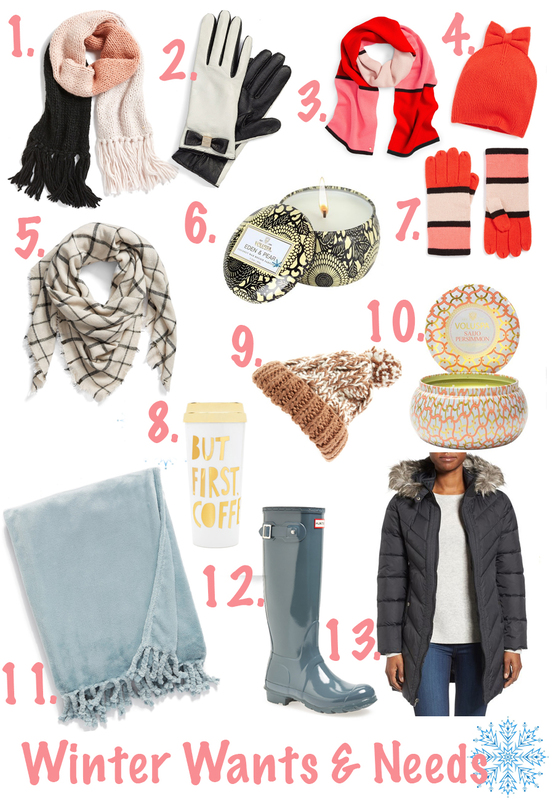 I thought I would create a “Winter Wants & Needs” collage to help us get through the winter with some items that can make it better for us! 🙂 How adorable is 2, 3, 4 and 7? Bows and vibrant colors are always amazing! I think these would be cute gifts for Valentine’s Day which is right around the corner…hint, hint to the man in your life! You can never go wrong with a surplus of candles, especially any of these Voluspa candles as they always smell amazing and they have the cutest containers- perfect for laying around the house! Bear has been extra snuggly lately, I think even the weather is getting to her. Lately, she has been sleeping in between Pat and I and normally I think she gets hot so she jumps down, but she has not been doing that. She has even been digging to get under the covers. Winter, winter, please leave now! Previous Post Leopard Fur Coat + Snow!